Recommended reading age 13 years +. Anastasia yearns for a normal life and wants to rid herself of the violence of her recent past. Her health issues force her to choose a career where her life will not be put at so much risk. She enters into the world of fashion, hopeful for a more sedate pace of life, and her friend Charlotte is back on board. Now world famous, Anastasia must take great care who she trusts and welcomes into her family. Despite losing the life threatening and exhausting pressures of Series III she now faces new pressures she hadn't anticipated and the detectives pick up where they left off in Series I and II. Join Anastasia in her latest adventures. Series IV is aimed at teenagers/young adults. Part One of the first story in Series IV, Anastasia is reunited with an old friend and meets some new characters as she embarks on her newest venture: The House of Anastasia. 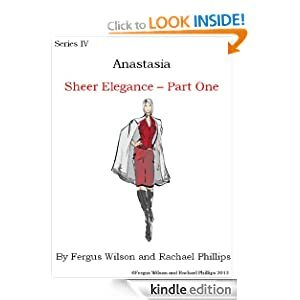 Desperate to lead a more conventional life after the exhausting missions of Series III, Anastasia starts up her own fashion house. Surely nothing unusual will happen there? Join the girls as they prepare for their first fashion show and discover there are those waiting to trip you up along the way. Part Two, Anastasia and Charlotte get to work on the launch of The House of Anastasia with some help from some interesting, new characters. Expecting a more predictable pace of life after the missions of Series III Anastasia tries to figure out what a letter of warning means but has it come too late? There is a traitor in the House; can the young detectives solve the crime and save Anastasia’s reputation and new business from ruin?